This page shows general products. The ►Digital Valving Search is used once you have your Gold Valve Kits to get specific valving and setup information. If you need Technical Support please call 951.279.6655 x109. We offer ►Suspension Seminars twice a year. Lots of information is available in the book ►"Race Tech's Motorcycle Suspension Bible". "My 1981 YZ465 you guys set up for me is one of the best suspensions I've ever been on." ►How Emulators work in Damping Rod Forks. From the book "Race Tech's Motorcycle Suspension Bible". TNK manufacturers OEM quality replacement fork tubes for Street, Road Race, Sport, Sport Touring, Touring and Vintage motorcycles. They are highest quality and generally significantly less expensive than original equipment. ►Read More! ►Gold Valves are bolt-on damping performance kits that allow you to custom valve a stock fork or shock for any rider's weight, type of riding, and ability. ►Click Here to find recommended spring rates for your bike. ►Non-Standard Shock Spring Fitment- Do you have a shock that needs a spring? Fill out this PDF form and email it or give us a call at 951-279-6655. We'll figure it out. ►Click Here for more details on Hi-Performance Springs. The stock 16mm shock shafts found on most modern stock shocks are at risk of bending under the extreme circumstances of modern Supercross, Arenacross and Freestyle competition. Thus the Race Tech Pro Series 19mm Shock Shaft Kit was born, and ultra-durable shock shaft to withstand the rigors of Supercross and Freestyle. The RT Shaft Kit is 40% stronger than stock shafts! 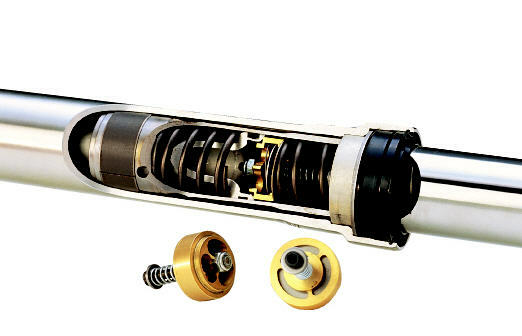 The RT Pro Series Shock Shaft Kits also include a built in Rebound Separator, and a spring top-out (instead of the stock hydraulic setup for KYB units). This provides better initial movement,better grip and better firmness. Flat Track riders particularly benefit for a much wider adjustment range to deal with the changing track conditions during the day and around the country. These 17-4 Stainless Steel Compression Posts replace the stock aluminum units. The stock units can bend with the extremely stiff setups required for modern Supercross, Arenacross, and Freestyle competition. These units are FOUR TIMES STRONGER than the stock posts and are a must for Supercross, Arenacross, and Freestyle Motocross. Race Tech's Shock Shaft Assemblies for DR650SE and KLR650 upgrade the stock unit by adding a Gold Valve, Rebound Adjustment, and Rebound Separator Valve. The KLR Shaft Assembly also converts the shock from an old-fashioned Emulsion to an Internal Floating Piston. Shock Shaft Assemblies also have the option to lower the seat height when you place your order. ►Read More! RT Reservoir Piston Assemblies replace the stock KYB plastic component that is known to break. Made of billet aluminum. Replaces the stock plastic component. Does not trap air beneath the seal. Made of billet aluminum. This pic shows the placement of the 0-ring. Made of billet aluminum, many of these increase nitrogen volume and add a recessed Schrader valve for easy recharging and durability. KYB Shocks 40, 46, 52, 57 and 64mm. SHOWA Shocks 40.5, 48.5 and 54mm. - Highest quality spring steel. - All major ID and OD's available. - Packs of 10 is standard. - Quantity breaks of 100 and 1000 available. ►Click here for a list of valving shims. In general, OEM seals manufactured by NOK are the highest quality available. We stock OEM seals or NOK in most cases. Our purchasing volume allows us to beat most OEM prices on seals. ►Click here for a list of fork seals. ►Click here for a list of shaft seals. We stock OEM Bushings only. Even if you have a model without any available replacements, we may have them in stock. Do a Product Search to find the proper replacement. ►Click here for a list of fork bushings. Dimensions and prices included. ►Click here for a list of shaft bushings. Dimensions and prices included. TSPR 50 – $14.99 This tool allows removal of the shock piston from the body without damaging the piston band on the new Suzuki Showa shocks. The tool fits in the circlip groove to allow the piston to slide past the groove without damage. Install internally on the shock shaft to lower the bike up to 4 inches. Not recommended for shocks with top-out springs. Each kit includes a combination of 2 and 3mm thick spacers so you can lower in 1mm increments. Bottom-Out Bumpers are an often overlooked part of shock maintenance. Original equipment bumpers start breaking down immediately. They are typically effective over 25 to 33% of the suspension travel and, particularly on dirt bikes, can make a huge difference between a plush landing and one that's not so plush. ►Click here for a list of Bottom-out Bumpers. Dimensions and prices included. Look your bike up in our ►Product Search for proper application. We have a complete line of replacement bladders for KYB and SHOWA shocks. ►Click here for a list of all available reservoir bladders. Dimensions and prices included. Look your bike up in our ►Product Search for the proper application. Race Tech has Pivot Works linkage and shock bearing kits for modern dirt bikes and ATVs. Have you ever seen a ruined Showa shock shaft with the peening ground off too far? SPSN 12125RN is a shock shaft nut with tabs on the top. The nut fits on Showa Shock Shafts (M12x1.25) holding the valving while the tabs are meant to be bent over to hold the rebound seat in place. HMNB 162212 - The Suzuki LTR450 stock shock needle bearing are not captured so they fall out easily. This replacement needle bearing is caged and permanently solves the problem. These replace stripped rebound holders so you don't have to buy a complete cartridge. We have all kinds of little tricks like this. If you've got wrecked parts it is quite likely we have a fix. Give us a call. FSRK 121002 - Ever stripped a Showa Twin-Chamber Damping Rod? This clever little nut has longer threads so you just cut longer threads on the rod with a die (not included) and install the new nut. The fix is stronger than the original. Early Husqvarna forks piston bands commonly wear out and eventually break. These parts are obsolete from the factory. Race Tech is dedicated to vintage. We produce hi-performance replacements for early 70s to mid 80s conventional 35 and 40mm forks. These bands are very slippery and seal exceptionally well. Air Control System allows the effective oil level to automatically adjust for big hits, braking bumps and G-outs. Great for motocross and off-road. You will be impressed! ►Click here for a list of available Shock Rebound Separator Valves. Dimensions and prices included.